Interested in a penguin behind the scenes tour? South America, around the Falkland Islands. Breeding colonies range from the Golf of San Matieas in Argentina (southeastern coast), southwards around the islands of Tierra del Fuego, and northwards toward the Pacific coast of Chile. Diurnal (active during the day). After the breeding season (Sept/Oct and Dec/Jan/Feb), adults spend time at sea, feeding in preparation for their annual molt in March. The molt lasts 3 to 4 weeks, after which adults leave the breeding site and remain at sea until the following breeding season. During the winter season, penguins from the Atlantic coast migrate to the coast of Brazil while the population of the Pacific Coast migrate as far north as Peru. Squid, small fish, and crustaceans. Hunting in groups, Magellanics generally forage at depths of less than 50 m (165 ft) but may dive up to 100m (330 ft). Winter foraging often takes them beyond their breeding range, traveling as far north as Brazil. The head and upper parts are black apart from two broad white stripes beneath the throat: one running up behind the cheeks and above they eye to join the pinkish gape; the second running adjacent to the white udder parts with which they merge above the legs. The chest has scattered black spots. Females are slightly smaller than the males but have similar plumage. They stand about 28 inches (70 centimeters) tall and weigh about 9 pounds (4 kilograms) but can range 3.8 kg-6.5 kg (8.25 lb-14.25 lb). 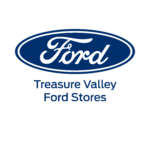 Breeding season is in September to early October and again in January through February. Breeding colonies range from the Golf of San Matias in Argentina, southwards around the islands of Tierra del Fuego, and northwards up the Pacific coast of Chile as far as Coquimbo. Females begin breeding at 4 years of age and males at 5 years. Males use sounds (‘donkey-bray’) to attract females to their nesting site. Magellanics generally show strong site and mate fidelity; pair-bonds are reinforced by allopreeing and hitting bill tips against each other. Adults arrive at the nest sites to breed in September and after a period of burrow excavation and repair, begin egg laying around mid-October. They generally nest in burrows that they excavate themselves where soils are less sand and more clay. Burrows are spaced much further apart than surface-nesting penguins. Where the soft soil is lacking or too hard for burrowing, they will nest above ground in shallow nests under vegetation. Nest densities are about 20 nests per 11 square feet. While on land the penguins are shy and often hide in their deep nest when bothered. Two eggs are laid in the burrow four days apart and weigh about 1/3 lb (125 g). Incubation takes around 40 days, with the female incubating eggs for the first shift, while the male feeds at sea. Males forage at distances of up to 500km (300 miles) away from the breeding site before returning to relieve the females 15 to 20 days later. She then goes to sea for a similar period and, when she returns, the two birds change over at regular intervals until the eggs hatch. The chicks remain in the burrow for about 5 weeks. The male and female share brooding during this time. Chicks are fed daily with adults leaving the colony in early morning and returning with food later the same day. Magellanics mostly forage within 40 km (24 miles) of the nest site but distances become longer as the chicks become older and demand more food; the chicks may then have to wait several days between meals. At 30 days, chicks have developed their mesoptile plumage and venture out of the burrows. At this stage, they are brown-gray above and creamy white below. This plumage provides excellent insulation when dry but lacks waterproofing ability, losing much of its insulation properties when wet. Consequently, many chicks can die from hypothermia in heavy rain conditions when burrows may flood. Otherwise, larger chicks often sit outside their burrow entrances and rapidly return to the safety of burrows at the first sign of danger. They go to sea and hunt for food on their own when 60 to 70 days old. Magellanic penguins are a warm weather penguin. During the warmth of the breeding season, they lose the feathers around their eyes and the skin underneath turns a pinkish color. When the weather turns colder, the feathers around the eyes grow back. Magellanics, like all other penguins, are flightless, but use their wings to “fly” in the water; their webbed feet serve as rudders. Torpedo-shaped bodies facilitate penguins’ movement through the water. Like most birds, penguins have good vision and hearing, with a poor sense of smell and taste. 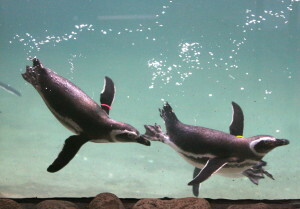 Penguins recognize one another by vocalizations. They are highly social birds and nest in colonies. 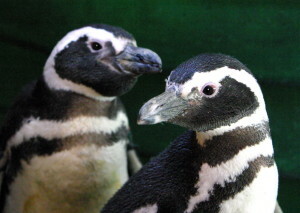 The black back and white bellies provide “countershading”, a type of camouflage from predators (such as seals); when in the water and viewed from below, the penguin’s white belly blends in with the bright sun on the water surface; when in the water and viewed from above, the black coloring blends in with the dark ocean waters. Like most penguins, they exhibit counter shading – i.e., a dark brown or black-colored dorsal side (back) and a silvery white colored ventral side (belly). This is both for camouflage for hunting its prey as well as a defense from the Magellanic Penguins’ predators. Sea lions, leopard seals and orcas (killer whales) prey on adult penguins. Chicks and eggs are predated on by avian predators such as gulls and skuas. Where the penguins nest in burrows, such predation is greatly reduced. Magellanic penguins are named after Ferdinand Magellan, who saw them in 1519 on his first voyage around the tip of South America. 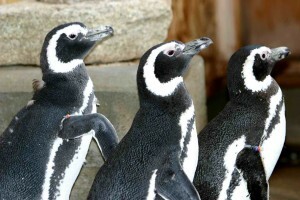 The penguins at Zoo Boise do not live in salt-water, but any salt they would need is supplemented through their diet.